This Friday 12 October, Luis Prieto's original remake of Nicolas Winding Refn's classic cult film Pusher will be in UK cinemas, our review thoughtfully entitled: An appreciation of Luis Prieto’s Pusher or what you need to know before seeing the remake of the cult classic Pusher can be found by clicking the aforementioned title or here!. But before Richard Coyle unleashes his most intense performance yet onto the British public we got to sit down with Super model turned actress Agyness Deyn (who glows with a white light in real life), the revelatory powerhouse Richard Coyle who cracks us up with switching between menacing and joking (at least I hope he was joking) and the man himself Nicolas Winding Refn who has just finished shooting his follow up to Drive, Only God Forgives with Ryan Gosling in Thailand to talk about making an original remake of Refn's Pusher. Below is what I can only describe as a photo taken in Frank-o-vision! That is - how a man sees after living in the head of Frank (Richard Coyle) from Pusher's head for a week. The Establishing Shot: WE TALK PUSHER WITH NICOLAS WINDING REFN, RICHARD COYLE & AGYNESS DEYN, a photo by Craig Grobler on Flickr. Of course during the chat we managed to cover a wide range of topics that included uncovering nuggets like Nicolas Winding Refn did not grow up across the tracks in Copenhagen's gangster neighborhood, How Kevin Smith's Clerks was an inspiration, how Pusher came about , he clears up the misconceptions about the Pusher TV show, why now is right for a remake and London the right setting, as well as two bomb shells about his upcoming films Logan’s Run & the possible Drive Sequel and what makes an engaging film. Richard Coyle on being typecast, making an original remake and bringing intensity to his role as Frank and Agyness Deyn on her transformation from Supermodel to Actor and preparing for her role in Pusher. Craig Grobler: Nicolas, casting your mind back to the early days can you tell us a little bit about the genesis of your original Pusher and how it came about? Particularly the environment - is the Danish underworld something you know about? Nicolas Winding Refn : Well, I know nothing about it. I’m not a crime groupie and I don’t read about crime or anything like that. I was brought up in America in what I would say was a cultivated Scandinavian home on Manhattan. The origins of Pusher were that when I was 19 or 20 my uncle had the biggest film art house Distribution Company in Copenhagen as well as the biggest art house cinema. And each year he would take me to Cannes and I would work for him in the film market sand that was very educational for as I would learn to; buy & sell movies and understand how the market worked from a business perspective. I would go see movies and realised that if a film doesn’t grab you within 10 minutes you don’t buy the film and you are out the door. So I didn’t learn anything about artistic expression or what my childhood had to be like to make films it was purely about market value. Of course I wanted to make movie and I had been making films at my mother’s house and she and my step father would always help out by paying, or making food for the crew so it was very family orientated. When I was about 22 or 23 I made a short film called Pusher which I applied to National to the Film & Television School with, but I didn’t get in. The following year I was in Cannes and I met Kevin Smith, who was there with Clerks and I saw it. I thought I can do that. So I went home and my mother was going to give me £10,000, my uncle had a cinema and my step father had a 16mm camera and I was going to make a gangster movie – because market wise I knew they could sell. It was a decision driven by commercial commodity. Then miraculously somebody heard about it and through a very long story I was able to get a couple of £100,000s from the Danish Film Institute and I went off and made it. 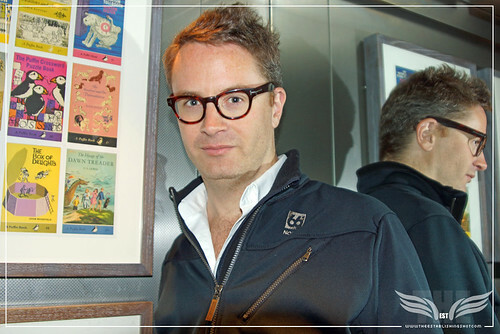 The Establishing Shot: PORTRAITS - NICOLAS WINDING REFN IN A LIFT WITHOUT A HAMMER, a photo by Craig Grobler on Flickr. There is a bit of cynicism about remakes, especially remakes that are made into English and I was wondering what is different about Pusher and why remake it in English now? Nicolas Winding Refn: Well I never saw the Hindi version they made over here but making Pusher in Bollywood is probably more extreme. For many years people were coming at me to buy the rights for Pusher for America. There was a television concept; there were other ideas and even an American script written for a remake and so forth. But it never really materialised and I didn’t have a lot of interest in it. So it wasn’t really until Rupert Preston who I worked with on all my films up until Drive and is a very good friend of mine was interested in maybe doing a remake, we had talked about it over the years and he said it was time to do it. I knew he wanted to do and I said sure go ahead. But I did go out and I found the writer, a guy called Matthew Read who is a good friend of mine and a good writer and I brought him in to adapt it and call me when it’s done. Craig Grobler: Nicolas can you tell us a little bit about what Luis, Richard and Agyness bring to Pusher? I’m assuming you have had had some sort of master mind role in the project? When I met with Luis we had a chat and I said this is your movie, I didn’t want to interfere, because I felt it would be disrespectful and I especially didn’t want to interfere with the choice of actors which turned out to be very good. My role was more along the lines of if they wanted to talk I was available, but they didn’t. When I visited the set it was a strange, déjà vu but with Richard and Agyness there. This was very much their movie. Richard is playing this character and he’s playing it in a different way from the people I worked with which is great because why would you want to make the same film again? Richard should make the choices he wants to make with Luis and it’s not my place to interfere with those decisions. 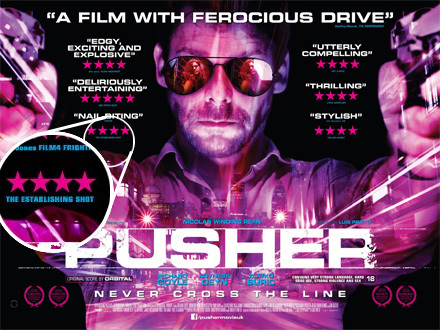 I guess Pusher could be set in almost any city but what do you think London, specifically brings to Pusher? Nicolas Winding Refn: One of the things about the concept of Pusher is that it is set in an urban environment and you can set it anywhere really; there is nothing original in the concept. My Pusher films were not about crime but about people in a criminal environment so it was more of a morality tale set in a criminal situation. Of course London being one of the major metropolitan cities of the world it is certainly is a very fitting stage and a perfect cross between America & Europe so I can’t imagine it taking place anywhere else and I thought it was a clever idea. Agyness how did you prepare for your role as Flo the stripper? Agyness Deyn: Reading the script I interpreted it that Flo had a child like vulnerability about her which I fell in love with so and that made me realise that I didn’t have to transform myself into a typical stripper and I was able to have a play with something different. When she is at work she has a persona that has to be the opposite. Craig Grobler : Agyness just to expand on that how has the transition from catwalk to film set gone? Has it been easy or challenging? Agyness Deyn: I suppose hard work in a way of being dedicated. I want to work hard, and I don’t expect to be given anything just because of my modelling or inversely not. I made the decision and wanted to throw myself into it, but in a gradual way. I believe in gradient and don’t want to go from one extreme to the other, so I started off doing little things, and learning, absorbing everything I could watching people on set. Richard I’m part of that generation that sees you as that guy from Coupling and hopefully Pusher and Grabber will change our minds does that sort of pigeon holing weigh on your minds and career decisions? Richard Coyle: Well I guess it can be a blessing or a curse as I’m an ambitious actor and there are a lot of things I want to do. It is frustrating to be pigeon holed and I work very hard not to be and try do lots of different things so it’s a blessing and a curse. Taking about Nicolas’s original Pusher, Richard & Agyness did you see the original and take anything from it? Agyness Deyn: Luis asked us not to watch it. I suppose he didn’t wan to duplicate what someone else had done. Richard Coyle: I haven’t seen it but I’m fully aware of its status and the esteem in which it is held. I didn’t think it would help me that film casts a long shadow and we were trying to make our own take on it. Carrying Kim Bodnia on my back. Wouldn’t have helped. Richard, I hope you don’t mind me saying but you look pretty terrible by the end of the film. Richard Coyle: Yea, I felt pretty terrible by the end of the film as well. Was it quite intense to step into the heightened paranoia world of Pusher? Was it hard coming off set? But it was hard to leave it all on the set at the end of the day. Craig Grobler : This role and your role in W.E. are intense and a bit different from your earlier more fantastical stuff how do you prepare to get into that mindset? Agyness and Richard you are two of the big names involved in Pusher another two are Paul Hartnoll, Phil Hartnoll otherwise known as Orbital, many of the scenes in Pusher seem to be built around the music, was Orbital collaborating early on and the music in place so you could react to it or did it come later? Richard Coyle: They came on board subsequent to the shoot and wrote to suit what they saw. Agyness Deyn: The club scenes were really fun and temperamental at the same time, because we’d just go in on a club night and it’s a raging drum-and-bass night and become so engrossed in the whole atmosphere. It was mad. Craig Grobler: Nicolas, James Sallis recently wrote Driven, a sequel to his book drive and I was wondering if you had been discussion about possible sequels? Nicolas Winding Refn: Definitely not. Craig Grobler: So the Driver dead to you? Nicolas Winding Refn: No. but I have some other ideas. Craig Grobler: Nicolas I have to ask what can we expect from you and Alex Garland for Logan’s Run? Nicolas Winding Refn: Well you can’t expect Alex Garland because he is not involved. So that’s one thing. Mhh! My take on Logan’s Run, well I’m just writing away. Craig Grobler: Nicolas a lot of people try to analyse and dissect your films breaking them down to core components, with that in mind what do you think makes an engaging film? Nicolas Winding Refn: I think that drama is heightened reality and in heightened reality, the loss of life is the essence, in a way. Around that so many different factions can spin off. But life and death can be played in many different ways, and in many different scenarios, so there is never one, straight answer. Our review of the remake of Pusher can be read here: An appreciation of Luis Prieto’s Pusher or what you need to know before seeing the remake of the cult classic Pusher. In London, a drug pusher's life spins out of control over the course of one week.